If you have been on this site a couple of times you probably know that over the last 6 months I have been getting ready for my annual adventure: for 2015, I chose to walk the Cape Wrath Trail in just over 10 days and 10 nights, fully self supported, walking around 250 miles through the bogs, mountains, and forests of the Scottish Highlands. Let me start by saying that I’ve done it! 250 miles (or 230 miles of walking for me) in 10.5 days, and what days they were! This trail has been amazing, challenging, heart breaking and uplifting all at the same time. The stunning landscape of the last truly remote and solitary place in the UK reminded me of what is important in life and why I do the things I choose to do: my family, nature and our ability to do amazing things. In this series of posts I want to sum up all I’ve learned about the Cape Wrath Trail, how it is that I did this adventure and how you can do so too, either in the “fast and light” way I choose to do it, or in the more sane and relaxed way of walking the trail in 3 weeks. I will take you through my “why”, and explain how I did it, and what else you need to be ready for. This is the first part, explaining some of the pre-trip issues and the first 3 days of my trip. The next post will be up in a few days and will cover the bulk of the trip from the fourth day until the end of day 8; the last post will have the last few days and some conclusions I reached about the trail, the gear I used and thru hiking. 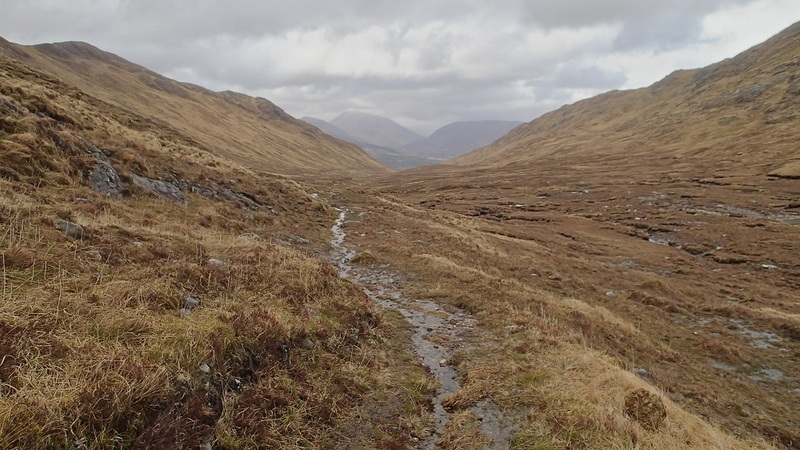 The Cape Wrath Trail is an unofficial long distance trail and as such it is very remote and rarely walked. 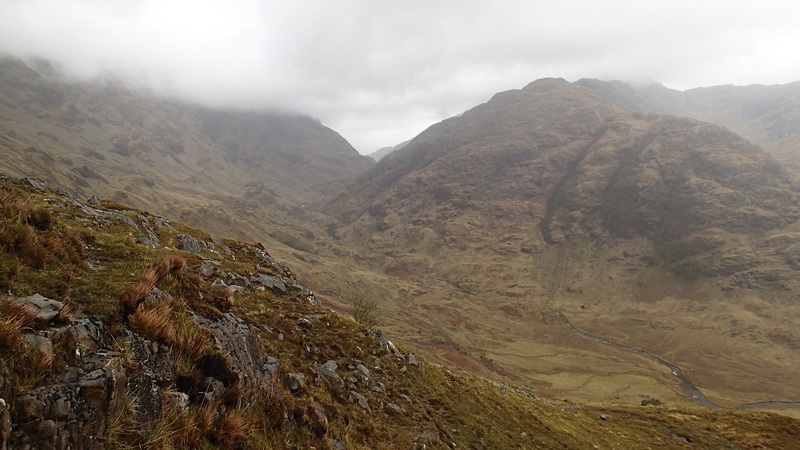 I have always been drawn to those remote and hard trails – maybe it is my need to feel that I’m on the edge and pushing my survival limits – so the Cape Wrath Trail became my goal in the UK. I decided that I had to do it. Despite my need to be in remote and harsh places, I’m also very much a family man and being away from my family is hard. The longest I had been away from my wife was about a week (in eight years!) and only 3-4 days away from my daughter, so the idea of doing this trail over 3 weeks was not an option. From reading, doing research and over estimating myself I decided that I could do the trail in 10 days, basing it on my ability to walk 25 miles a day over several days. I originally planned on setting out in May 2014, but that decision was made only a few months prior and I needed to accept that I did not have the fitness, the gear nor the skills for such an undertaking (and what I did have instead was a newborn baby…), so May 2015 was the new time frame. Over the last year I spent my time training, updating my gear, learning about the trail, working on my navigation and developing the best menu for such an extreme adventure. Walking the trail in the time frame I chose would not have been possible if it wasn’t for the amount of preparation I put into it, and even with it I had a hard time finishing it, both physically and mentally. many, the ferry will not cross and the only way on or off Cape Wrath is by walking back through the bogs. 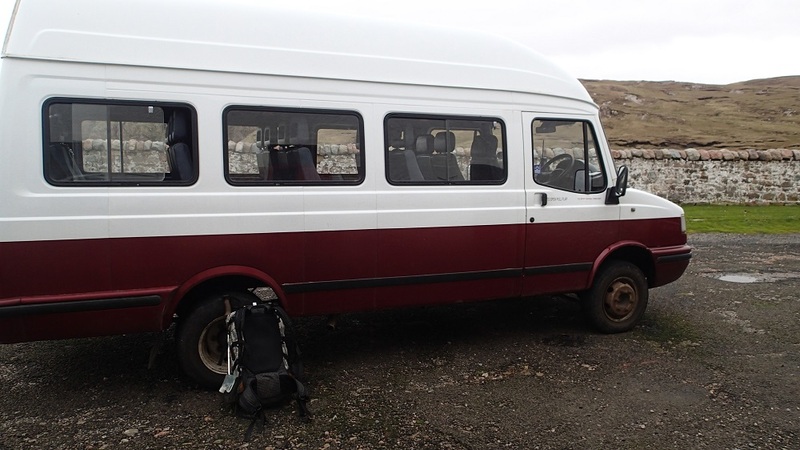 There is a minibus that goes between the ferry and the Cape, operated by James, who only does the 14 mile ride (roughly an hour) if John will be at the ferry to get people across. You can see how John’s whims can decide whether you can come on or off the Cape. I met several walkers who did the trail north (from the Cape) to south (Ft. William) and actually had to skip Cape Wrath due to it being inaccessible. On the day that I finished the trail, I woke up early and so got to the lighthouse at Cape Wrath at roughly 9:45 in the morning, thinking I would have to wait till 13:00 for the minibus and ferry connection back to Durness. To my surprise, the minibus arrived to the lighthouse at 10:15 since a big group of tourists had paid extra for the John-and-James duo to get them to Cape Wrath, despite John’s decision not to do any crossing of the kyle that day. I jumped at the chance to take the ride back and actually managed to get off the cape, just before John called it the day and headed to the pub! 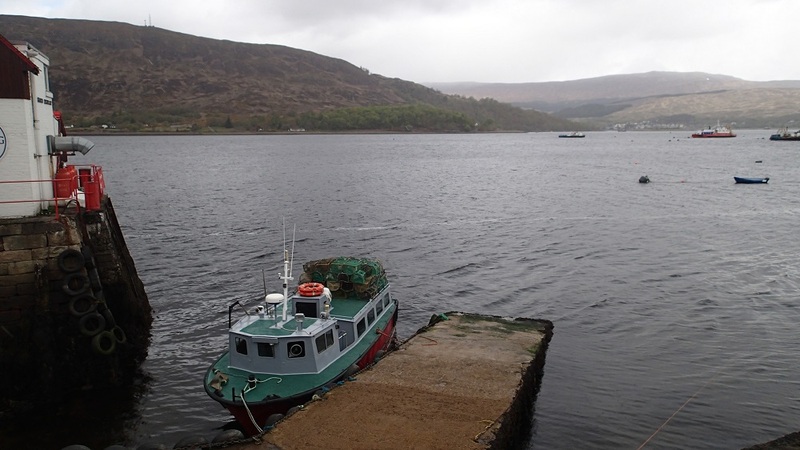 Some useful information: Cape Wrath Ferry: site, or call John for crossings: +44 (0)7719 678 729 Cape Wrath minibus: site, or checking with James: +44 (0)7742 670 196 Last point to know about the Cape Wrath area is that it is a MOD (Ministry Of Defense) training ground, mainly for naval training, so during times of training the area is closed. It is important to check in advance that there is no training going on as it is very dangerous to try and cross the firing area at that time. It seems that almost all the business around Cape Wrath and in the Kilochbervie area will have the information on display (accommodations, information centers and some cafes), but you can also check yourself: MOD Freephone Tel: 0800 833 300 or on the Cape Wrath site. * By technical I mean either with no path or with very hard sections in the trail. I based my walk on the route that is advised by Ian Harper in his great guide by Cicerone, with some small alterations or adjustments using the Harvey’s Cape Wrath Trail maps. The guide breaks the trail into 14 sections, with each section taking 1-2 days to walk. In the first 4 days I walked 1.5 sections each day, and then did a couple of days doing 2 sections a day and then one section per day. The reason for that is that on the second day I made a terrible navigation mistake (more about it later) that cost me half a day and much fatigue and slowed me down, and during the last 4 days I was just too tired and battered to be able to walk more than a section a day. I managed to walk the whole trail except for 2 sections that I decided to skip due to time limitations and fatigue/injuries: on day 8 I skipped an 18.5 km section due to time limitations, and on day 9 I skipped a 10 km section due to fatigue and injuries. Both of those sections were covered by hitch hiking from one road meeting point to the next connection point. Though I felt bad (and still do) about skipping those sections, the alternative would have been missing the Cape Wrath area, which happens to many walkers who are pressed with time or suffer physically, I think I made the right call on that. The key for me on this trip was ensuring a good recovery overnight to be able to repeatedly take my body through another rigorous day, and I managed to achieve that thanks to my great and efficient menu. Each morning I woke up stiff, but with no real muscle deterioration and after some stretching and warm up managed to go through another day of 10-15 hours of walking. I lost some weight, but definitely not as much as I would have if it wasn’t thanks to my careful meals and nutrition planning. As a side note, the two main issues I had on the trail were joint inflammation (ankles and knees) and foot injuries, both as a result of inadequate footwear. I’ll talk more about these in the last post. at around 17:30. The pass itself starts on a good trail but at the top it turns wet and boggy, introducing you for the first time to the Highland’s famous bogs. The boggy section is around 3km, then connects to a 4×4 road near Allt na Cruaiche (stream). This is the first point where you have cell phone signal after Fort William. The 4×4 leads you to Glenfiennan and you can either walk by the side of the A830 road (what I did, accidentally) or on a 4×4 road just south of the road. At Glenfinnan I turned north again under the viaduct which is very impressive and walked on a paved road all the way up to Corryhully bothy (about 4km from Glenfinnan). Corryhully bothy is an estate bothy, which means it is privately owned and actually has electricity! The owners do ask for a donation to cover electricity use but the bothy itself is free. I got to the bothy at 20:30 after roughly 40km of walking, the last hour in pouring rain, and I was very happy to find the bothy full of dry wood and a fire already going. At the bothy I also met a German woman who had started the Cape Wrath Trail, and after 4 days reached a hard river crossing that she decided was too hard for her. The first person I meet on the trail is quitting! Not a good start. The rain continued all night long but the bothy was dry, albeit cold and very basically decorated with a concrete floor, a simple fire place, a few sleeping platforms and some chairs. I had dinner, some broken chatting with the German lady and some much needed sleep. Day 2 started with a light drizzle but I was able to be ready by 7:00 after food and repacking. Having the bothy to get ready in with the rain going outside makes a big difference and I said good bye to the German woman keen to set out. I even managed to get my phone charged a bit before leaving. managed to make a dramatic navigational error that cost me dearly in time and fatigue. The trail follows the river and crosses the Dessarry and small streams that spill to it many times. At the western edge of the forest, the river splits to a northern spill and a southern one; the Cape Wrath Trail goes on the northern one and I took the southern one. To avoid this mistake you can also cross the river on a bridge that is 300 meters from the bothy and use another 4×4 road that is on the northern side of the forest, that way you stay on the right side. In any case, I took the wrong glen going to the pass and instead of reaching Loch Nevis as I should have, I reached Loch Morar, just to the south of Loch Nevis. I reached the Loch’s shore at about 16:30 and decided to have a short day and just go to Sourlies bothy on the loch’s shore and rest. When I arrived to the loch I realized that nothing matched the map I had, so I continued walking on the northern shore hoping to find the turn north and the trail. After an hour of walking on the north shore and not finding anything, I saw some people on a row boat and tried to get their attention, but without luck. I walked back to where I came off the pass to the loch and tried to use my limited map to understand where I was. The maps that I had and the guide didn’t show the loch I was at, so I couldn’t pinpoint my location. 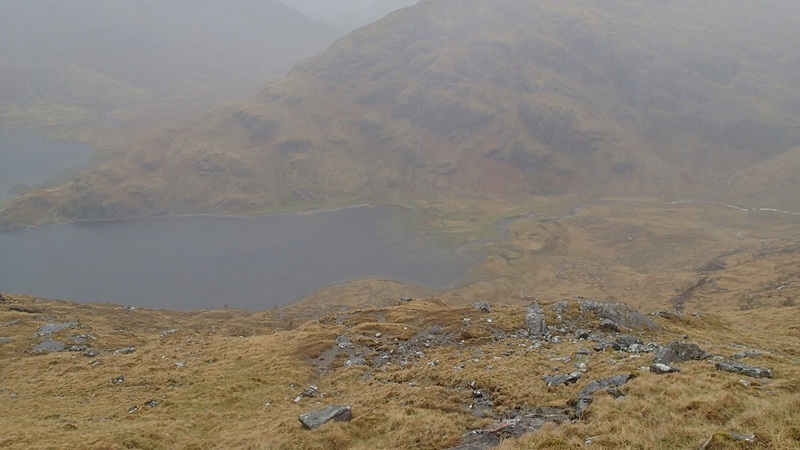 I eventually concluded I was at a loch south of Loch Nevis and I had 2 options: go back or try and climb the ridge to the north (Bidein a’Chabair, around 650-850m high). I went for the climb. By now it was 18:00, and I was already tired and panicking. I climbed the ridge in constant rain and no trail for about an hour and reached the clouds. The whole top was in full cloud cover and I somehow managed to get turned around and started to descend back to where I started! At this point I took my compass out and followed a strict “up and north” route to the top. The climb was hard but the descent was what really got to me. It was a steep descent and midway I needed to take out some painkillers to try and finish the walk down. I arrived to the shores of Loch Nevis at 20:30, soaking wet due to the rain, the waterfalls and streams on the ridge and I could barely walk the 500 meters to the bothy. At 21:00 I reached the bothy to find it almost completely full (I managed to squeeze in), with no firewood for a fire and full of wet and very grumpy middle aged men. I attempted to hang all my clothes and gear to dry in the limited space of the bothy, had a quick dinner and jumped into the sleeping bag. Sourlies bothy is located in an amazing place, but the bothy itself is small, very drafty, cold and not very welcoming. The lack of wood around makes it a slight disappointment, but at the end of the day it had walls and a roof. Day 3 started as grim as day 2 ended – rain was still pouring, some of my bothy mates had woken up at 4:00 (AM!) to start the walk to A’Chuil bothy (remember day 2 lunch? ), so we all had a broken night. I joined the remaining bothy dwellers in a slow rise, slow coffees and the reluctant process of donning still-wet clothes. 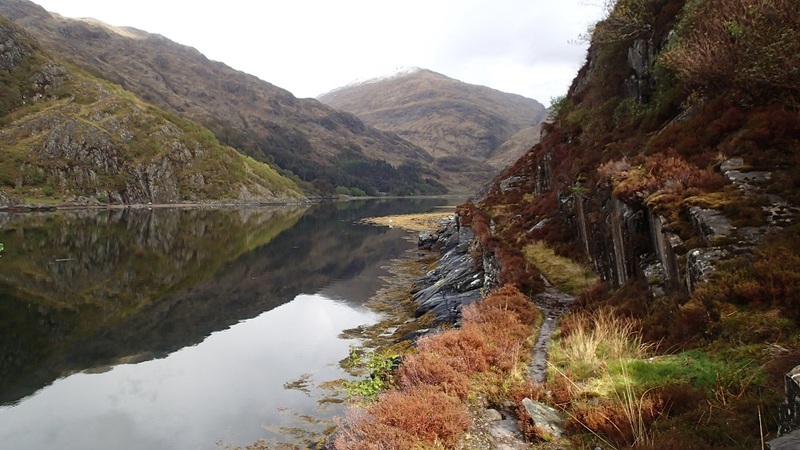 Eventually we all got dressed, fed and packed, leaving Sourlies to our separate ways – me to Kinloch Hourn and them to A’Chuil. The walk takes a clear path that goes straight into ankle deep bog all the way to the bridge over River Carnach and then joins a clear 4×4 road that stays with the river heading north for about 6km. At some point the trail turns smaller and smaller, disappearing at times into the boggy river banks, but the sun was finally out and my spirit was up. I still had no cellphone signal to get in touch with home (I hadn’t since the first night) and I felt strong pangs of home sickness, despite the improved weather. After the 6km on River Carnach, there is a 90° bend in the river where the trail leaves the river to join a different trail that heads north west. This is a tricky section as there is no real trail to join the other, clear trail. When you reach the bend, just climb straight north (get the compass out!) in between the two small streams that spill into the river. After about 200-300 meters you will reach the clear trail, there is no way to miss it as it will cross your way at some point, even if not going straight north. Once with the clear trail, take a left (west) and stay with the trail. It is a bit of a climb, but once you reach the pass, the valley opens into great views towards Barrisdale bay. The weather was warm enough for me to be in my t-shirt and to finally ditch the Sealskinz socks I had been wearing for a couple of days (I would not put them back on) and my feet felt immediately better. I got to the bothy in Barrisdale bay in good time and had coffee. The bothy is a private bothy (like Corryhully) and has running water, electricity and a toilet! It is £5 a night to stay in the bothy and £3 to use a tent next to it. This is where I planned on spending the second night before I reached the wrong loch (…) and it would have been nice to stay there, even if there is no fire place. After my coffee I started the seemingly simple walk to Kinloch Hourn to camp for the night, just to be shown that is actually longer and not as easy as I thought. 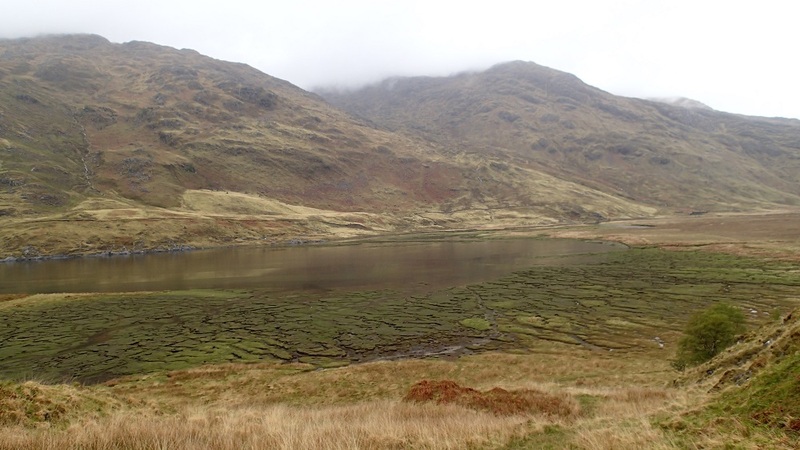 The trail is clear throughout, starting with a 4×4, and then turning east on Loch Beag on a narrow trail all the way to Kinloch Hourn. After an hour or so of walking, I accepted that it was longer than I thought so I slowed down and just enjoyed the view on the reflection of the moors on the water. 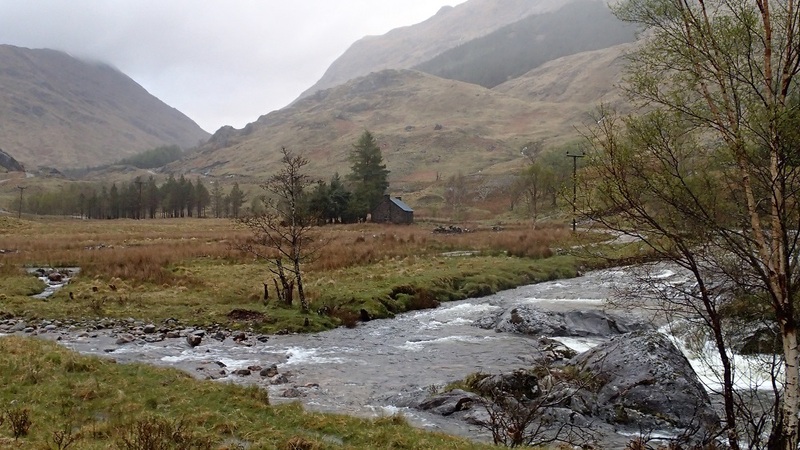 I got to Kinloch Hourn at a good time (around 17:30) and found the camping place: just past the bridge. There is really nothing there in terms of amenities or even people (I was the only one to camp there). Camping is supposed to cost £1 per night, but I couldn’t find a person to give money to, so I never did pay. I got to the site, had a good river bath, did some laundry and just rested, as my body needed. It was an early night after not being able to get in touch with my family for another day and my Kindle suffering some fatal malfunction. It was a dry evening but rain was back throughout the night. This is the end of part 1, camping in the comforts of Kinloch Hourn. I will see you soon as we are gearing up for long and hard days in the beautiful and wild parts of the Cape Wrath Trail. I’ve been looking forward to you writing about your trip – I met you on your night at Sheneval (I was the guy setting off to compete my Munros….which I did). I look forward to the next reports and have been inspired to walk the trail myself at some stage, but probably in shorter sections. I hope the day up the Munros was good, the weather from late morning was perfect for such a challenge – did you end up camping or did you get back to Shenavall? I’m glad that you are finding this inspiring, it was definitely a real challenge but every rewarding. I actually met a guy at Glendhul that have been walking the route (with all the alternatives) for 17 years now, 2-3 days at a time, and he will be finishing the trail next year, maybe a possible way of doing so? I am recovering now, though not back to running yet. The next part will be up in a few days as the original post ended up being very long, so I wanted to make sure it is possible to read it. Thank you for the kind words and I hope you enjoy the rest of the report and find the motivation to do it yourself! I’ve enjoyed reading your report. I met you with my walking partner, Jackie, at The School House Bothy, Doag Bridge. (just before Oykel Bridge). We completed the full trail in 20 days, May 9th – 29th – but then we are both over seventy! It was an amazing experience, and we met some fantastic people as well as a lot who gave up in what must have been the wettest, windiest and coldest May for years! We were both carrying about 15Kg and my only injury was a painful left knee for the last week. HI Paul, good to hear from you, I’m glad to hear you endured and made it despite the terrible weather we had. Watch the video and it is great – what amazing pictures, and thanks to you I finally saw an Tallach… How did you manage to get the images to look as if the weather as sunny and nice? Mine are all wet and grey…. Great report which I enjoyed reading! I would really like to do this hike, or at least a part of it. Is there any places along the route where you could end the walk and get back to Edinburgh by bus or train? We only have 10 days free to walk, so I don’t think we will be able to finish the whole route. I’m glad you enjoyed Louise, the trail is much better than the report.. I would probably recommend looking to split the trail at Ullapool, going to or from there. There is public transportation and all you for last minute supplies. It is pretty much at the middle of the trail 8n terms of distance. Either head north from Ullapool (or Inverlael if you want a rougher start) and go to Cape Wrath or do the Ft William to Ullapool section, both will offer wild sections, though slightly different landscapes. When are you planning on walking the trail? Ullapool looks like a nice place to end our journey (starting from Fort William), since it seems like it’s much more work getting from Cape Wrath and back. We will start walking in the first week of May this year. We’re hoping for a few more sunny days than what you ended up with, but are preparing for the “worst”. Do you think there will be any snow up there at that time? Yes, travelling to and from the Cape is a challenge and often not guaranteed due to water conditions in the Kyle of Durness. I myself still not sure about snow, this year been very mild so far, with barely any snow, but is might come late in the season. I only had snow once on Coire Mhalagain above Kinloch Hourn, but it was passable with some careful footing. I’ll be doing the trail again in April and will probably have a write up about it including the conditions, so that might help closer to the time.